Mini mason jars are a crafter's best friend. If you love mason jar crafts, you're in for a treat! Love mason jar crafts? Then you are going to LOVE these DIY projects with mini mason jars. I recently picked up an entire case of mini mason jars (can you tell I'm obsessed??) and I've been crafting with them like crazy. I just had to share some the awesome ideas I found. They have all the charm of regular-sized mason jars, but are 100 times cuter. Don't believe me? 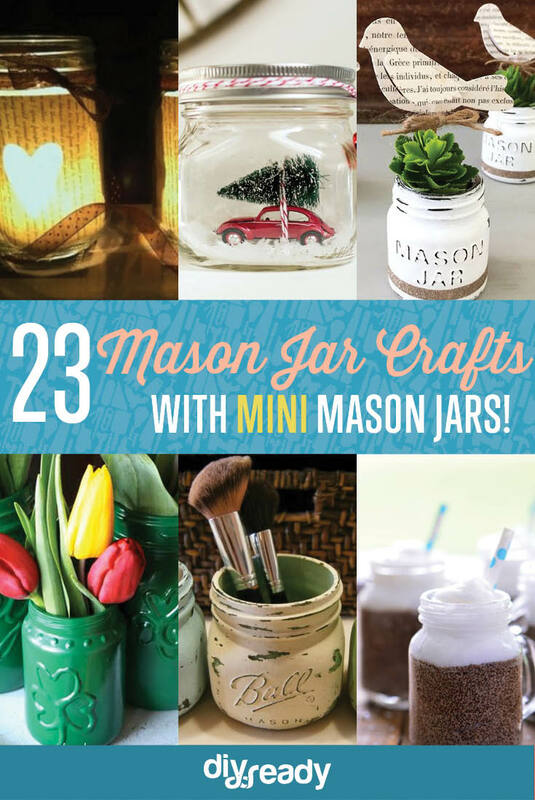 Try one of these 23 DIY mini mason jar crafts and tell me you don't say “awwww” at least once. Perfect DIY Christmas gift or ornament. Put this on your holiday to-do list now! Tutorial here. Aren't these just lovely? Pssst: they make great DIY wedding favors. Details here. What a great way to serve your pies. Adorable! Details here. I love recycling old pages of newspapers, books and yellow pages. It's just so calming. Tutorial here. So chic! Grab this idea from Kelly's and you can create your own business card holder in a flash. Details here. Looking for another paper craft project? Check this out! Time to declutter with mini mason jar organizers! 🙂 Details here. Who knew an air freshener could be so darling?? Details here. This is just too cool to pass up! More on this mini mason jar craft here. A great outdoor lighting idea. Tutorial here. A beginner sewing kit that is also a great gift idea. Details here. Say goodbye to tangled twine. Fab DIY Christmas tree ornament. Grab the tutorial here. This lip and body scrub smells so good you'll want to gobble it up! Details here. Feeling lucky? 😉 Tutorial here. A mason jar craft to keep in mind for Halloween. Details here. A creative way to keep your snacks. Tutorial here. Glam up your table with this keepsake and photo holder! Details here. The coolest idea I have ever seen to present a cupcake. Details here. Where/how can I buy some mini mason jars? Often you can find them at Hobby Lobby, Target, Etsy and other crafting stores. Google search “mini mason jars” to see where they’re currently available. It’s very easy to purchase them online. Hope that helps! Dave Curto, you can find them at most Wal-Mart stores – this tiny/mini size is what we use for jams and jellies during canning! Happy diy-ing!